The great Johnny Mandel gets his due with this 3CD set featuring three of his classic scores for M-G-M. Go here for the free online notes for this title. The multitalented Mandel is a legendary composer, arranger and songwriter who in the 1960s was one of the freshest voices for the screen. He came from the jazz world and specialized in intimate, lovely and poetic scores, two of the best presented here: The Americanization of Emily (1964) and The Sandpiper(1965). His ability to craft a melody to a film, and to arrange it with a characteristically transparent sound (often spotlighting woodwind solos), was renowned especially by his fellow musicians. The Americanization of Emily is a war (or, arguably, anti-war) film starring James Garner an American Navy attaché (and self-described coward) during World War II who falls in love with a war widow played by Julie Andrews. As their philosophies conflict, and Garner is thrown into a perilous situation on D-Day, the film blends drama, romance and satire in a way seldom achieved with such success (the brilliant screenplay was by Paddy Chayefsky). 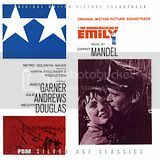 Mandel’s score is a gem featuring a lovely waltz theme for Andrews’s character (given lyrics by Johnny Mercer and recorded as “Emily”), ironic-sounding military music and heartfelt dramatic scoring. How Mandel managed to balance the film’s changing tones—from comedy to drama to romance—is a marvel. 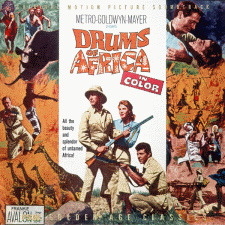 A third film on this collection is little-known but offers an opportunity to hear Mandel tackle a genre for which he is not known: Drums of Africa (1963) was a B-movie adventure starring Lloyd Bochner, Frankie Avalon and Mariette Hartley mixing it up with African slavers amidst stock footage. Mandel used a reduced orchestra for budgetary purposes (heavy on the percussion) but gave a melodic, jazzy bent far removed from the typical B-movie score of the era. He made use of his characteristic woodwind solos as an evocative way of “speaking” for the animals encountered in the story. The score interpolates a song, “The River Love” performed twice in the film by Avalon and composed by Russell Faith and Robert Marcucci. This 3CD set is entirely in stereo and has been newly remixed and remastered from the original three-track 35mm scoring masters. Disc one features The Americanization of Emily (expanded from the Reprise LP); disc two is a complete presentation of The Sandpiper; and disc three features Drums of Africa as well as a recreation of the Sandpiper soundtrack LP (which was produced by Quincy Jones). Liner notes are by Deniz Cordell incorporating new interview comments by Mandel as well as Jack Sheldon. Due to the amount of research and writing, the 32-page booklet features essays on the films and scores; the track by track commentaries can be found—for free—at FSM’s online notes. Are the track-by-track liner notes for Americanization of Emily going to be put on the site soon? I just bought the set, and I've already printed out the liner notes for the other films, but I'm still waiting (as well as others I'm sure) on the notes for Emily. Aside from the notes though, I have been waiting and waiting for a complete soundtrack to come out for Emily, and this release is a very exciting one for me. As for the other two films, I'm still waiting to see The Sandpiper, and I'll just have to enjoy the score to Drums of Africa without seeing the film first (which is not something uncommon for me since I've done that before with Eye of the Devil, The Satan Bug, Joy in the Morning, and many others). I look forward to receiving the set very soon. Great, thanks for doing this job! And thanks for Deniz Cordell for writing the notes in the first place. We do endeavor to get these notes online by the time the title goes on sale, but in the case of the Mandel notes the CDs arrived at SAE a couple weeks earlier than expected. Thanks for your patience and I hope everyone is enjoying all the great Johnny Mandel music. The soundtrack Americanization of Emily, is as they say, in the booklet,achingly beautiful. As soon as I saw it was avaiable, I grabbed my copy. I love Mandel's work. 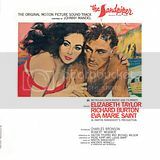 From this great collection I only knew 'The Sandpiper', the Verve release of the Quincy Jones produced original LP/CD release. I even prefer the original soundtrack cues. You close your eyes and you see the ocean swells in bright sunlight washing on the beach. I somehow never got hold of the 'Emily' LP and I absolutely love that score too. Even 'Drums of Africa' is nice as a 'bonus'. The sound is crystal clear and it fits in nicely with the rest of the 3CD set. This is music I will play over and over again. A very big thanks to FSM for this excellent release! Hello...back in the late 70s, easy-listening radio played a wonderful version of "EMILY" which was sung in full harmony by a mixed chorus, accompanied by an orchestra. It was arranged in 4/4 time with a bright tempo; in contrast to the usual 3/4 time slower, waltz-style of the original. I never learned who the artist was. Can you tell me if the "bonus" track on the CD (which states in the liner notes as 'slightly faster') could be the one I'm looking for? Unfortunately, I don't have a system to listen to the sample. Someone once mentioned that Henry Mancini recorded a cover the tune, and though ascap.com lists him among the performers of EMILY, folks in the Mancini camp say that he did not. I wish I could get word to Mr. Mandel himself to see if he can shed some light on this mystery. Thanks so much? John W. "Jack" Cave, Vincent N. DeRosa, William A. Hinshaw, Herman Lebow, Arthur Maebe, Jr.